Back in October a US-based client came to Arcbazar looking to source designs for a master suite, consisting of a bedroom, a bathroom, and a walk-in closet. The goal was to both update the layout of the space to make it more functional and create an interior design that would appeal to the maximum number of potential buyers as the property was being put up for sale. 28 Arcbazar designers and architects submitted their proposals. Designs came from all over the world: Egypt, Spain, United States, Nigeria, Indonesia, Italy, Albania, France, India, Romania, Greece, and a number of other countries. The client opened up the project to public voting and received 670 votes in total, including 505 from other designers and 140 from family and friends. This was truly a group effort and crowdsourcing at its best. We were blown away by the designs and decided to share them with our readers. Due to the number of submissions, we will only focus on the top three designs as selected by the client, though we definitely encourage you to take a look at the rest of the submissions. Here we have some pictures of what the space looked like originally. As you can see, it was pretty much a blank canvas for Arcbazar designers. The second place went to 19first_architects from Greece. It too beautifully balances out such luxuriously looking items as the chandelier and tufted chairs with the roughness of a distressed area rug. The ottoman is a pure delight. While minimalistic in its design, golden accents instantly add sophistication and elegance. Finally, coming in the third place is a design by reem sn from Egypt. Our favorite part about this master suite bedroom design is how reem sn had skilfully combined textures and patterns. Different shades of green, solid and patterned designs, and a range of fabrics come together in perfect harmony. 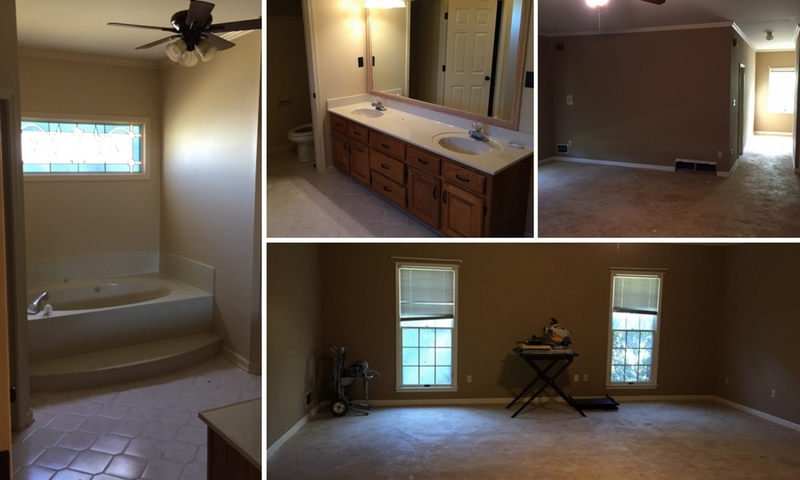 Let’s move on to the second part of this master suite renovation – the bathroom. This bathroom design submitted by Mika will most definitely appeal to a lot of potential buyers. You have both a standing shower and a bathtub. There is plenty of space and light. The vanity table will make your morning routine that much more pleasant. The entire design is done in neutral colors, which is generally recommended when selling a house. Yet, it will be easy to personalize it with a splash of color with bright curtains or chair, for example. The design submitted by 19first_architects is very different, but just as magnificent. That bathtub and a tile backdrop that extends all the way to the floor are simply magic. We also love the contrast of lighter and darker wood on the floor. There are so many other lovely details in this design – the soft pink of the ceiling and wall lights, the marble counters, and others. reem sn continues the green theme in the bathroom. The way muted and brighter shades of green are combined in this design create an elegant and warm space. Pay attention to the beautiful tile design on the walls of the shower room. Last, but not least, is the walk-in closet. Her it is all about function and maximizing space. Which one is your favorite master suite design? You too can easily source architectural design ideas on Arcbazar. Be it remodeling, interior design, new residential, additions, or landscaping – our network of thousands of designers across the world got you covered. Not only will you receive 10 design ideas on average – complete with floor plans and renderings – but you will save 60% of the cost!